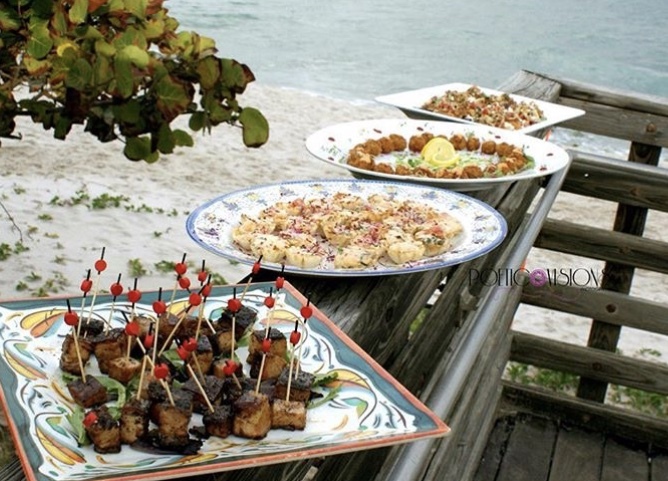 We booked the Food Shack for our wedding at the Jupiter Civic Center because it is the best restaurant in Jupiter (probably the best in the Southeast) and we wanted our guests to have a taste of why we love South Florida. At first, they were unable to handle our event because they were already scheduled, but one of their chefs (Mike Murge) freed up and was able to do the wedding for us! We met at the Maxi’s Lineup bar one evening after work where we worked out the details and the price and Mike Moir/Mike Murge put together an outstanding menu for us. We also were able to hire one of their bartenders (Sue) for the evening to bar tend at our wedding. On the day of the wedding, Chef Murge showed up early with his crew of guys/gals and they set up an entire temporary kitchen on the side of the building. They did all the prep work and cooking right there! They set up plated appetizers and 2 of their servers handed out passed appetizers during the cocktail hour. When it came time for dinner they cooked the fish fresh for the guests and created plates of our favorite dish (Sweet Potato Encrusted Hog Snapper) and everyone raved about how great the food was. The servers cut and served our wedding cake as well.